The autumn feasts in the third time among God’s seven feasts in three times began with the Sacred Assembly of the Feast of Trumpets on September 1. Ten days later, on the 19th, the Sacred Assembly of the Day of Atonement was held. This year, which marks the hundredth anniversary of the birth of Christ Ahnsahnghong who restored the new covenant which was ruined after the Apostolic Age, the members of the Church of God in 175 countries participated in the services all together, ruminating on the meaning of the feasts and the grace of God. 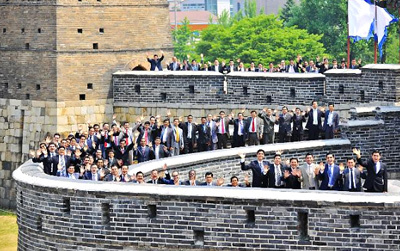 New temples have been built consecutively in the first half of the year 2018 in Korea, and in July, the first month of the second half, dedication services were held in Mungyeong, a scenic tourist city, and in Yeongju, the city of seonbi [virtuous scholars], in the northern part of North Gyeongsang Province of Korea. Keeping in step with the movement to preach to seven billion people, the Churches of God are now being established even in small cities of each country. New churches have been built in some areas of Korea, too: Cheolwon in Gangwon Province; Banghak-dong, Dobong-gu in Seoul; Gyeyang-gu and Nam-gu in Incheon. 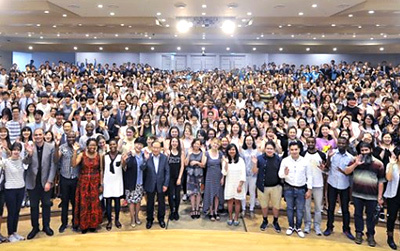 The IWBA Entrance Ceremony 2018 was held at the Okcheon Go & Come Training Institute on June 17. In the entrance ceremony, more than 7,000 people attended, including enrolled students, freshmen, transfer students, the pastoral staff, and teachers in charge of young adults. In addition to the IWBA photo exhibition, there were booths to show the activities at workplaces, providing useful information to the young adults who want to live both their social life and their religious life meaningfully and to spend their golden age without regret. On June 14, 2018, the 15th World Blood Donor Day, the Church of God received the plaque of recognition from the Korean Minister of Health and Welfare. 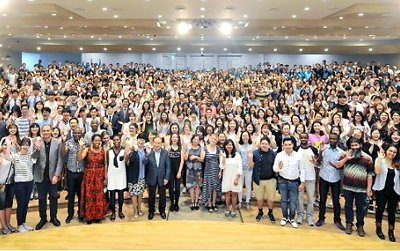 The 14th Foreign Language Bible Preaching Contest held on May 27, 2018, at the Okcheon Go&Come Training Institute in Korea. Around 6,500 members checked their ability of preaching in a foreign language, and firmly established their will to complete the mission of preaching to seven billion people. As if it proved their enthusiasm for the mission, which becomes more fervent year by year, the number of participants in the contest increased by more than 1,000, compared with the previous contest. On May 25, 2018, the dedication services were held for two churches in Jeonju. On June 19, the dedication service was held for the Nakyang Church in Uijeongbu, Gyeonggi Province. While carrying out the Preaching to Seven Billion Movement, the members of the Church of God all around the world attended the Ascension Day Service (May 10) and the Sacred Assembly of the Day of Pentecost (May 20), expecting the work of the Holy Spirit that occurred 2,000 years ago to be repeated again. On April 24 and May 1, 2018, the dedication services for the two Churches of God were held in Seoul—the center of Korea. On April 3, 2018, two days after the Resurrection Day, the dedication service for a new temple was held in Osan, a transportation hub in the southern part of the capital area in Korea. On the 17th, there were dedication services consecutively in Taebaek, a clean city in the inland area of Gangwon Province, and in Jecheon, North Chungcheong Province, which is known for tourist attractions such as Cheongpung Cultural Properties Complex, Uirimji Reservoir, and Bakdaljae Pass.